Laboratory mice are an important component of laboratory research as a model organism for biomedical testing. They are genetically similar to humans and are an inexpensive and common solution to testing experiments in living mammals. As the science of genetics and biology continue to advance, the science of the lab mouse will also need to advance in order to achieve better results through experiments and to bring treatments to market faster. Research and development will be a key process in accomplishing this. Mice (Mus Musculus) are commonly used as a model organism in laboratory experiments and testing because they are inexpensive, highly available, easy to handle, and have a fast reproductive rate. They are also considered a prime model of inherited human disease and share 99% of their genes with humans, which implicitly allows for them to be solid genetic analogs and accept genetic modifications for experiments. Rats (Rattus Norvegicus) are also common and are larger than mice with larger organs and more blood, making them useful as toxicology and neurological models. Because they are 99% similar to humans, mice can be humanized through genetic modification to create a closer genetic analog for some experiments or tests. This further allows them to be good preclinical screening and safety testing models in lead identification and optimization. regimens for new treatments. In 1993, there was a human drug trial which proved fatal for 5 people, this was later proven to be preventable if mouse models were used in pre-screening for liver toxicity. Even though mice and humans have very similar genes, how those genes are expressed or regulated are different. Understanding how the expression of genes in mice works will shed light on the results of experiments and ease the translation to treatments for humans. Mice are in common usage today, however experimental design is a serious concern, including the choice of animals used in the experiment and control groups. While the industry provides some documentation and specification regarding the quality of their mice, it is still up to scientists themselves to design experiments that fully account for genetic and environmental variables that may affect results. Mouse models usually take time to mature, may be kept in different environments, and don't have the same immune systems that humans have. These factors create concerns for ensuring they give quality results in different or changing environments. The National Institutes of Health's (NIH) Office of Laboratory Animal Welfare (OLAW) sets standards for the kinds of model organisms and experiments allowed for funded academic research. Excluding irrelevant animals that may have died or were incorrectly affected by environment, balancing sample populations for gender, splitting littermates among experimental groups, and tracking genes can all improve the design of the experiment Companies like The Jackson Laboratory (JAX) provide mice for laboratories that are highly documented and specified in order to increase experimental quality and reliability. While lab mice have been used as mouse models for a very long time, there have been recent innovations in how they are monitored, cared for, and utilized in experiments. 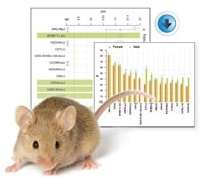 Genetically engineered mouse models (GEMMs) have reached new levels of sophistication, as well as the technologies that assist in caring for and testing mouse models. GEMMs are mice that have had alterations to their genes in order to remove or express random or targeted traits. GEMM mice are useful for studying interactions and relationships of genetics and disease. These mice are created with two basic approaches; the first is a pronuclear injection into a single cell of the mouse embryo, which randomly integrates into the genome; this creates transgenic mice. These mice are referred to “Knockins” because this method "knocks in" new or additional traits into the mouse’s genome. The second approach "knocks out" genetic information by modifying embryonic stem cells of the mouse with a DNA construct that is homologous to the target gene to be knocked out. The recombined cells are then injected into the blastocyst of the mouse. These mice are referred to as "Knockouts". One innovation in mouse model research is the use of different cameras operating 24 hours a day. Being able to film and analyze mice in controlled environments around the clock has uses beyond biomedical research for drugs. This type of surveillance may aid researchers in understanding the social or behavioral impacts treatments and experiments may have. In addition, there are concerns of the implications of interrupting a mouse's circadian rhythm or letting it acclimatize to a new environment. The design of cages, mazes, and other housing structures to contain or isolate mouse models have also changed to leverage the innovation in computer imaging and camera tracking by moving towards optimized materials and experimental setups for use with these systems. Another innovation in mouse models is the advancement of model system design to conducting gait tests. A gait test is a test that measures and analyzes a mouse model's stepping pattern as they walk or run. It's used to create quantitative assessments for footfalls and evaluate motor performance of a model. Gait tests are performed using digitally responsive treadmills that offer sophisticated, quantitative analysis. The latest technology in gait tests involves extensive automated measurement and analysis of footfalls, gait, and behavior. Noldus Information Technology's DigiGait system is the most widely-published system. Video and sensor technologies have allowed for increased experimental setups such as electrocardiographs and telemetry (which normally require surgery) to be conducted in a less-expensive, non-invasive and humane way. A companion to many emerging technologies is the use of databases and analytical software. Mouse model colonies can now be managed by databases - tracking pedigree, genetic information, and history among other data. These databases are accompanied by analytics tools and suites. 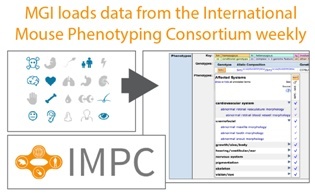 Because of these integrated solutions between existing data and more open participation in experimental data, scientists can use large databases such as Mouse Genome Informatics and Mouse Phenome Database - that feature search and analysis capabilities for genetic information of strains of mouse models. Another innovation comes in the form of robots and automation. 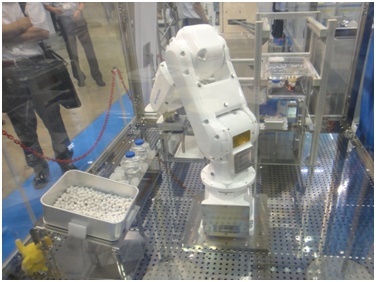 Nikkyo Technos and Yaskawa Electric have developed a laboratory robot to manage tens of thousands of mice in a lab mouse colony - up to 30,000 total. The robot can move, change, or clean cages, as well as add food to them. The functions of this robot cover 80% of the handling tasks with laboratory mice. Aside from the increase in quality of experimental conditions, resources, and results, these innovations would substantially lower the costs and increase the speed of conducting research associated with model organisms. Adding value and saving costs in the chain of research activities can create opportunities for some treatments that would otherwise be unprofitable or unmanageable to pursue and succeed. Taking a drug through development, testing, and trials and putting it onto the market can take over 15 years and over $800 million. This long and arduous process from initial development, through clinical trials, and into marketability contains a place called the Valley of Death - a place in the journey of treatment discovery and development where the risks are highest for abandonment due to unprofitability or success at too great a cost. This creates a disincentive to innovate certain treatments; some projects may end up dead before they are fully explored or developed. Genetically modified laboratory mice are potential testing model organisms which will accelerate research efforts for biomedical treatment projects and shorten the Valley of Death. In order to continue addressing translational gaps in biomedical sciences, ensure experimental quality, and improve research in biomedical fields, laboratory mice and other model organisms are sectors that should be engaged in R&D to advance the knowledge, understanding, and utilization of model organisms. This kind of research and development may qualify for large federal and state R&D tax credits.